First, let’s put aside the French label, the alienating mesh of language which puts off prospective wine buyers, let’s forget that when you learn French and you learn that brut means dry but on French sparkling wine Brut indicates sugar, and is in fact the sweetest, the drier being either Extra Brut or Brut Zero, let’s just not dwell on all that. And it will be a rare client in YVR who knows that “petillant” means, in a nutshell, fewer bubbles in the bottle. Let’s just put all that aside. This is something to really enjoy, semantics be damned. 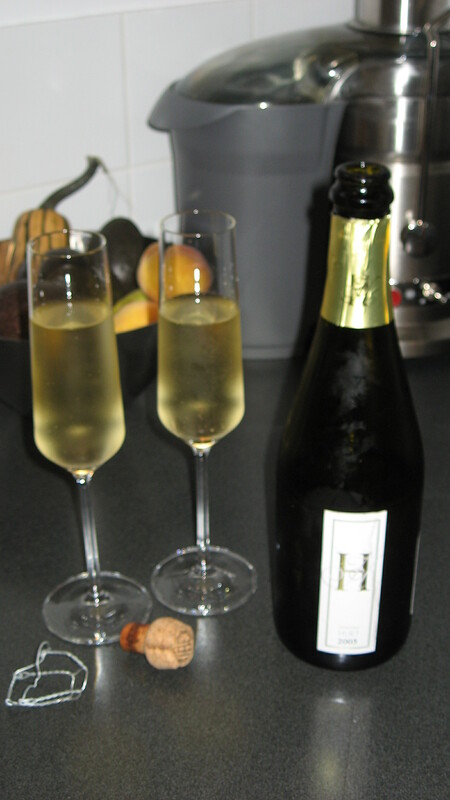 The Huet 05 Vouvray is a refined, elegant aperitif, glorious at six years. It puts Prosecco to shame, like soda pop versus fresh squeezed juice. There is apple, right in the fore. There is pear, apricot too, but apple, lottsa apple. The extremely light effervescence seems just exactly correct. No yeast. “Loverley” in its dryness. At 12% alcohol, we give it the OK. But expensive. We were 20% through a never-ending do-it-yourself kitchen reno and decided it was time to “reward the contractor” so we justified the expense; double the cost of cheap sparkly, half the cost of the “real” thing. Very nice compromise. Market Liquidity: An impressive special occasion pre-dinner quaff. Cameron Hughes gets a lot of press in BC. Marquis has touted his skill as a negociant and there is a special CH event at Everything Wine this fall. We’ve tried several of his wines and think there’s something “4-Hour Workweek” in the brouhaha; CH has a clever niche where they find some surplus wine, bottle it, and get it to market at prices lower than if it came from a “name” brand. Unlike, say, Priceline, there’s no wondering where you’ll end up: It’s right on the bottle. 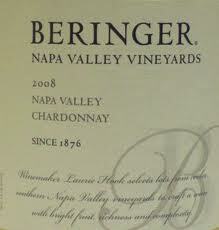 This chardonnay from Carneros, Sonoma. In BC, that’s nothing to sniff at, especially under $25. And the wine? It’s a pleasant, drinkable, buttery, very much in the French style. Good for pre-dinner drinks, not a cloying chardonnay, and complementary to fish. Not with the depth we anticipated though, at least as the label boasted. We did not get the “banana” or “citrus sorbet” but still loved every drop. Went back to buy more and it had disappeared; that’s the thing about buying wine in BC—as soon as something good comes along it disappears just as quick. Price: $22 but with the case discount less. Sometimes at Marquis; sometimes at Everything Wine. Market Liquidity: On special, an excellent buy for a versatile white. Price: $18.99 at Liberty, $15.99 at Marquis. Market Liquidity: Life is just too short to bother. From the cellar: In 2009 I received a very nice birthday gift: A bottle of 2007 Nota Bene, the “noted” red blend from Black Hills Estate now owned by a consortium including 90210 alum Jason Priestly. At the time it was selling for just under $50 and I thought, “what a wonderful birthday gift.” I laid it down. This year some friends got together for a dinner, including the guy who gave me the bottle, and I thought I’d pull it out. We drank it with a spectacular blackened steak salad (blackened BBQ sirloin sliced on micro greens with roasted garlic, charred red peppers and sinful gorgonzola dressing). The cabernet sauvignon-cabernet franc-merlot blend did not disappoint. Not one iota. 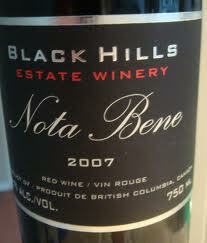 The 2007 Nota Bene, in late 2011, was over the top. I really shocked myself—having the discipline to keep it in the cellar two years. Being a born and bred British Columbian, and remembering the days of BC wine starting and ending with Andrés (now, of course, Andrew Peller, and not the screw top plonk of yore), it’s still hard for me to grasp how stunningly far (some) BC wine has come in less than half a century. This red blend was balanced, smooth but with depth, luscious, a huge cabernet type mouthful that was indescribably delicious, deep, dark, mysterious, and, yes, I regret describing wine that way but, really, it was simply that special. Remember the scene in The Godfather at Louis, where Michael shoots McClusky and Sollozzo, who are enjoying some fine Italian food and wine? If it had to be my last meal, this wine would have been a great way out. I wish I had been given two bottles! Downside? Note Bene’s humble beginnings were a red blend at 14 per cent alcohol. They’re now just shy of 15 per cent. I am not a fan of the higher alcohol content and, really, if you’re trying to impress someone, high alcohol content is just a ruse. it stands that should anyone want to gift me a case of Nota Bene, I can even arrange pick-up. Price: Expensive. Good luck in finding any. Market Liquidity: See last paragraph above. On the West Coast we tend to eat a lot of fish and, more often than not, salmon. Chardonnay and salmon are like bacon and eggs, tomato and basil, a marriage made in heaven. Picked this up for some wild sockeye; we had a bottle in Oregon and thought it was OK. It’s an understated chardonnay, inoffensive, easy to drink, hints of tropical fruits, but not quite the “richness and complexity” the label boasts. It’s the sort of white you might get at a wedding; no one will rave, no one will send it back. We drank it with fresh sockeye salmon, in season, off the BBQ, and it was wonderful. No complaints. But in Canada it’s twice as expensive as the US where we had our first bottle and, true to this blog, it tasted better cheaper. It’s also surprising that this is the “middle” chardonnay, the Founder’s Reserve is cheaper although we’re not going to test the waters on that. Price: For less than $15 USD this wine is a must buy (which is probably why Robert Parker called it “stunning value”). At Everything Wine, with the case discount, $27.59. Market Liquidity: Better Options Abound. This wine is preposterous. It has a silly label—yes, that picture at left really is the graphic on the front of the bottle—says “kapow” on the reverse, is a tad Fight Club and a little vintage Batman and all 100% totally over the top booze. Sure, it’s big juicy jammy fruity spit-roasting delectable knock your socks off shiraz. We had it with a braised brisket (four hours with root vegetables, spectacular), a perfect foil for a big tasty red meat dish. But 16.7% alcohol? Really? Wham, bam, thank you ma’am. No stars in my books, rather it deserves an equally huge alcoholic Seth and Amy SNL “Really?” with a double swish. Relevant sidebar: We were in Napa / Sonoma this summer. While tasting some exceptional zins at a “very reputable” vineyard I told the vintner about some syrah we’d tasted down the road that was nearly 17% alcohol. She said to me that’s because a) that vineyard waits until the grapes have been on the vine too long, there’s less water and with less water the grapes are cheaper to buy and b) the vintner at that particular house “likes to drink.” Her words, not mine. Seemed a bit snarky, but I have to agree—about the unnecessary alcohol content. Sometimes it’s as though houses are competing for booziness, not body. For me, for most people (wine reviewers, wine experts excepted, who live it seems in a la la neverland of fine vintages half drunk) wine is social and more often than not an accompaniment to food, a complement. It’s not something to have two glasses of and need a nap. One person at the table described it as “spicy” and not in a good way but rather in an Austin Powers mock innuendo. If there was a good wine that was archetypal as not to my taste, this might be it. Market Liquidity: Just say no. Better still, for a dollar less buy a bottle of the uber-refined and super smooth Highwood Distillery 10 year old Centennial Rye widely available across Canada. It will last twice as long and impress four times as many friends and, when the need arises, get you just as drunk. Postscript: See our comments on the NYT Wrath of Grapes feature here. Punditry: Sambal spicey, Bobby Flay kick. Not just pepper but spice cabinet dimensions. Raspberry, plummy, jammy, luscious from the get go. With food some of the fruit seemed like rhubarb, less lively, but still wonderful. Absolutely lovely start to finish. There is nothing not to like except, perhaps, what I thought was a rather shallow finish given the “nez du vin” as the “con-no-sirs” write. 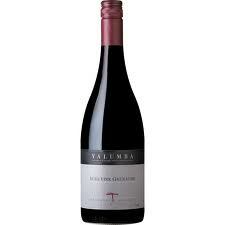 Nice big beautiful red, perfect for a special occasion with a hearty meal. Oh, and plaudits for another quality bottle with a screw top. Price: $24.99 at BC Liquor or Everything Wine but with the case discount at EW $23.74. Market Liquidity: I hate spending over $20 but I loved buying this wine. Simple, lovely, palatable but nothing schmantsy. 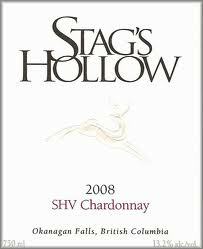 Sometimes SH gets it totally right; their Sauv Blanc a few years ago was the best in Canada and we plowed through a case. But sometimes they don’t. There is (I find) an unevenness to their wines, year to year. But this chardonnay is something to have lying around the house in threes and fours. Price: Not too much (under $17). Why are people buying Ozzie plonk when there’s this wonderful local everyday white? Market Liquidity: A superb house wine / everyday white. 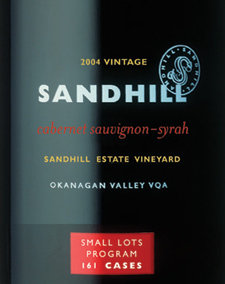 I love the Sandhill Small Lots wines. I hate the cost of Sandhill Small Lots wines (most $30 or more). I am therefore torn: There’s good wine for less but there’s worse wine for more. When it comes to BC reds, there is, too, a lot of pomp, posturing and pretense. Not with the SSL wines; they stand to be judged without the conceit that somehow, by dint of being local, we should give them a break. Although my favorite is the Barbera, the Cabernet Sauvignon Syrah blend is a beautiful bottle. I call the Cab/Syrah blend their “Breck” red: It’s full bodied with no loose ends. 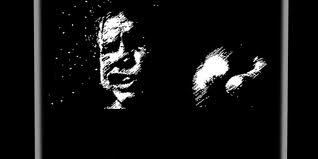 But it’s also a touch of Apocalypse Now, deep, dark, mysterious. Pepper, leather, vanilla. “Raid the spice cabinet” said one sipper. All that said, no one got the “fruitcake” or the “chocolate finish” the vintner had put on the label as a guide; that did (to us) seem pompous. That is because we are no con-no-sirs, uncouth and unskilled! No matter. If you’ve got cash burning a hole in your pocket, this is spectacular with meatballs. We recommend pork and beef. Price: $30 at Village VQA. Market Liquidity: A great blend that is overpriced.